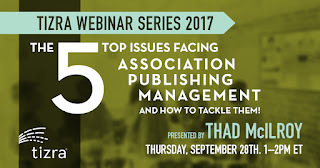 Free Webinar 9/28: "The 5 Top Issues Facing Association Publishing Management and how to Tackle Them!" The average American spends nearly 3 hours a day on their smartphone? And that just ten apps control 98% of that time. Amazon now controls over 50% of all books sales and 85%+ of ebook sales. The resurgence of print is "wishful thinking rather than an understanding of what’s actually happening". Publishers should raise prices: there 's far more flexibility than publishers think. The merger of the International Digital Publishing Forum (IDPF) with the W3C will enable DRM-protected books in browsers. These are just a few of the many insights you'll learn from digital publishing expert Thad McIlroy in Tizra's free webinar this Thursday. Thad has been on the cutting edge of technology trends for decades, authored or co-authored more than a dozen books, served as Program Director for the Seybold Seminars and written hundreds of articles and posts on subjects ranging from XML to metadata to marketing and publishing automation. The 5 Top Issues Facing Association Publishing Management and how to Tackle Them!